Vetiver's Andy Cabic has a surfeit of musical identities: He came up in North Carolina’s fertile music scene of the ‘90s, playing with college-rock act The Raymond Brake before decamping to San Francisco and immersing himself in the nascent folk movement that gathered around artists like Devendra Banhart. It was in San Francisco that Cabic started playing as Vetiver, while also beginning to work with Banhart himself. In addition, Cabic also played for a time with the instrumental dance music act Tussle—filling out a stylistic cornucopia for a busy musical mind. Cabic mostly performs as Vetiver these days, and he’s managed to stay busy. In addition to last year’s Tight Knit, which won plaudits for its shimmering fusion of pastoral folk and rambling classic rock, he’s been producing British folk legend Vashti Bunyan’s long-awaited follow-up to her 2005 album, Lookaftering. In advance of a show at the Bell House on Thursday (Jan. 21), The A.V. Club spoke with Cabic about taking time to write songs, the pleasures of dance music, and the nature of his collaboration with Bunyan. The A.V. Club: Before recording Tight Knit, you recorded an album of covers, Thing Of The Past. Do you ever find that certain beloved songs from the past compel the creation of new ones? Andy Cabic: It’s not something obvious to me, overtly. I don’t write songs often or quickly enough to say, “Oh, this song is inspired by this song.” Most of the songs I write, I take time to write them. I get a couple lyrics in January, a couple more lyrics in April. It doesn’t feel accurate to say one thing inspired a certain song. I kind of build a song up over time. Then after a certain point, you feel the momentum of the song, it has its own feeling. AVC: Is this an intentional choice of yours, or a matter of circumstance? AC: That quality—time in the songwriting and in the recording process—has been on all of my albums. Early on, I was playing with Devendra [Banhart]. We would start to track the basics of a record and then I’d be gone on tour for four months, and then we’d come back to the record and finish it. Every record has had that happen in some way or another. They’ve all had some break in the process that lasted two or three months. Not by design—it’s just the way it goes. I think that’s been helpful, because it’s let me loosen up my hold on [the records], as opposed to people who record and mix and do everything in a couple weeks. I string the process out. Some things that seemed really important at the time, maybe three weeks later they don’t sound right or you forget why they seemed that important. My feeling is that when I come back to it, it loosens my hold on the song and I hear it from a more objective perspective. AVC: You’ve played in and written songs for bands with pretty divergent styles of music. Is there anything that ties together The Raymond Brake’s '90s alt-rock, Tussle’s instrumental music, and Vetiver? AC: I guess you write for whom you’re playing with. At least I do. When I moved to San Francisco, I didn’t have anyone to play with. I also didn’t have an electric guitar. I had an acoustic guitar that was given to me by a friend and I was living in a really small room under the stairs, essentially a hall closet, in San Francisco, and that’s what I used to keep writing songs. I moved out here and I pretty much started all over. Gradually stuff happened. At the time I was doing Vetiver, I was also playing dance music in Tussle. 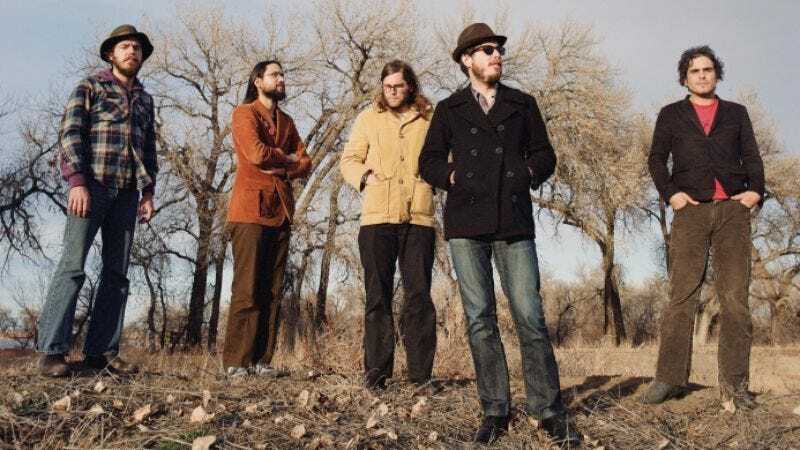 Vetiver was just an outlet for my songwriting and my conditions. But I buy a lot of records and I am always listening to a wide range of stuff. Like I already said, what might inspire me to start writing a song one January morning, it might be a totally different thing that is inspiring me to finish a song in September. AVC: Do you listen to a lot of dance music? And if you do, how do you bring elements of that to your Vetiver compositions? AC: I do. In a listenable way of what I bring to it, I would point you to the remixes I’ve done under the name Neighbors of Vetiver, which actually re-envision songs. I just did a new one that just came out last month. As I write songs that aren’t remixes—it depends. I’m very particular about the stuff I like. I think coming from a pop background, I tend to lean toward music that has a more narrative song-like structure, something that can be listened to from start to finish, whereas a lot of [dance music] maybe works better mixed into a set. Melody and space are mostly what I’m drawn to. A lot of that stuff that’s really minimal just has so much space and it suggests melodies that aren’t there—it lets you complete the picture. I find that really great. It lets me return to a song over and over again and not get tired of it. You’re not given lyrical content and meaning to sift through or dislike. There’s a lot of space for you to come in and add to it and bring something to the song yourself, ghost melodies that you hear and things like that. AVC: You’ve also been producing Vashti Bunyan’s follow-up to Lookaftering. How did that come about, and how it is going? AC: We toured together. We all rehearsed for a week and then went out on the road and played each other’s music. Everyone played on pretty much everyone’s songs. I’d met her before then, but that was the first time we really spent a lot of time together and played together. Shortly after that we played Carnegie Hall together and then I went on a tour with her down the East Coast. We keep in touch, and when she decided she wanted to start working on another record, she asked if I would want to be involved with it. She’s still writing it. We’ve done some demos, she’s done some demos, and we’ve done a little tracking, but it’s still in the preparatory stages. AVC: When do you think it will be ready? AC: I don’t know. Hopefully this year but it’s really up to her. It’s just a matter of coordinating time and figuring out how to build it. She took her whole life, virtually, to write Lookaftering, so I’m in no position to rush her to follow it up with another record.